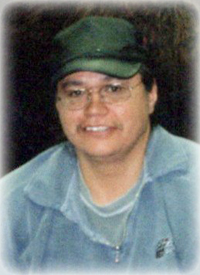 On January 18, 2019 Mr. Alvin Clifford Delver of Frog Lake passed away at the age of 54 years. He is survived by his children, Shelly Lewis, Tania Lewis (Elden), Chantel Buffalo, Travis Lewis, Clifton Lewis & Shayla Lewis; numerous grandchildren; sister, Agnes Sylvia Delver; step-brother, Gerry (Nicole) Gardner; uncles, Gabe (Agnes) Dion & Gabe Fiddler. Alvin was predeceased by his parents, Solomon & Catherine Delver; sisters, Mary & Patricia; brothers, Harvey, Dennis & Emery; niece, Joan McGilvery; companion, Mary Jane Lewis. A Wake will be held on Tuesday & Wednesday, January 22 (leaving Grace Gardens at 1:00 p.m.) & 23 at Norman C. Quinney Career Centre, Frog Lake. A Funeral Service will be held on Thursday, January 24 at 11:00 a.m. at Norman C. Quinney Career Centre, Frog Lake. Pastor Wilfred Cross will be officiating, with interment in Clearwater Lake Cemetery, Frog Lake. To send condolences online, please visit www.gracegardensfuneralchapel.com. Tanya, sending you and your family love and prayers. We were sad to hear of the recent loss of your father Cliffton. Those of us at Boyle Street Education Centre that you know extend our heartfelt sympathies to you, your family, and extended family during this difficult time of loss.